When I shuffle off this mortal coil, I’m pretty certain my ideal afterlife will be an ongoing concert by The Kilbanes, and if I’m worthy, God will welcome me to that concert venue in the form of Julia Brothers. 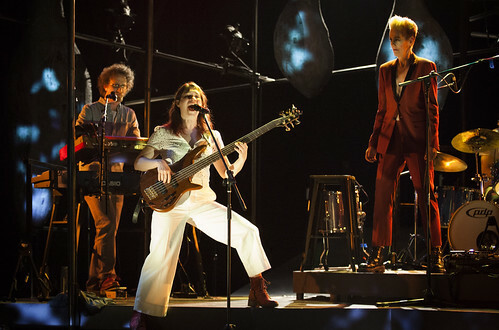 I hope that particular shuffle is many years away, but I got a taste of that heavenly vision at Z Space in the form of Weightless, a world-premiere rock opera by The Kilbanes inspired by a story from Ovid’s Metamorphoses and featuring Brothers in the role of a Bowie-esque androgynous God. 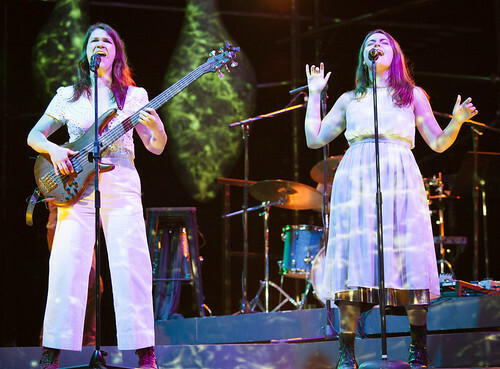 Like Once and Passing Strange and the Bengson’s Hundred Days (also born at Z Space – read more here), Weightless fuses the energy of a rock concert with the storytelling of theater. Emotions run high in this story of sisters Procne and Philomela who are so close they practically share breath and bones (as they sing in a closely, beautifully harmonized song). Their first challenge comes when their father wants to marry Procne off to a halfwit, so they escape and find their own paradise. But no paradise can last, and a man, Tereus, comes between them and terrible things happen. In this version of the story, adapted by Dan Moses and Kate Kilbane, the horrible things aren’t quite as godawful as they are in Ovid (the cannibalism, for instance, is absent), but they’re still pretty bad, and they (surprise surprise) fit right into our collective #MeToo moment. A man exerts his power to silence a woman. A woman summons her own power and fights back. In this version, God (who also serves as our narrator) intervenes to give us an ending that, like in Ovid, allows conflict, violence, pain and suffering to create beauty. In the story, that beauty involves music, so how perfect, then, that this entire 75-minute musical is also spectacularly beautiful. The beauty comes from many places, not the least of which is the divine songs by the Kilbanes and performed by a band that also includes Dan Harris on drums and Josh Pollock on guitar. Kilbane plays bass and also handles lead vocals as Procne. The extraordinary Lila Blue (all of 17 years old) lends her exquisitely expressive voice to Philomela, and her vocal mix with Kilbane is otherworldly. Pollock also performs (and is quite the scene stealer) as Tereus, the man who destroys the sisters’ paradise and then suffers the consequences of his abuse of power. The flexible Z Space auditorium, has been reconfigured so that the stage, with a long ramp, is central, with bleacher seating on either side and a bar conveniently tucked into the premium seats directly facing the stage. It’s a nightclub/theater set-up that works well (especially for the rotating roster of opening acts, who perform in the hour before the show – definitely worth showing up for). The stage looks like it’s ready for a rock concert, with intriguing pod-like structures behind the band (Angrette McCloskey designed the set). Those pods, along with the ramp extending down from the stage catch the lights (by Ray Oppenheimier) and especially the projections (by Hanna S. Kim) to give the stage texture and underscore the emotions of the story with some striking visuals. Weightless, directed with a firm and perhaps magical hand by Becca Wolff, is so completely absorbing that it’s easy to get lost in the captivating swirl of music and story, which is guided by Brothers, who is telling the story from an omniscient point of view but also a participant in it. Her wry take on a god’s view of humanity (one of the last gods who still cares about our earth-bound drama) is an irresistible mix of bemusement and melancholy. Even with a sad story like this one, there’s joy in the telling and, especially, in the music, which you could describe is indie-rock tinged with folk and pop and the simple beauty of two unamplified (for a brief time) voices joining in harmonic connection and sending chills through the entire theater. When a story is told with this much energy and passion, it’s easy to fall under its spell and, in the most ecstatic moments, feel a little weightless yourself.